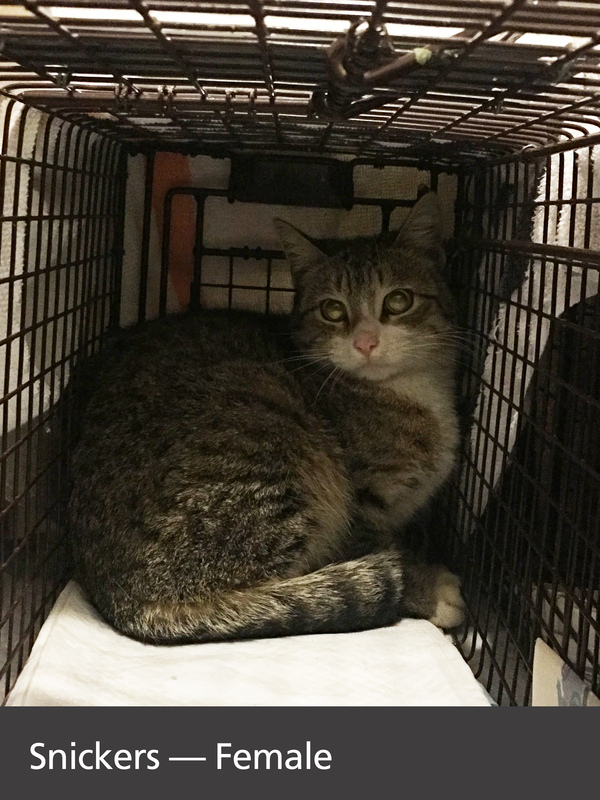 We posted about Crystal, a sick TNR’d feral cat from the Luna Colony two weeks ago. 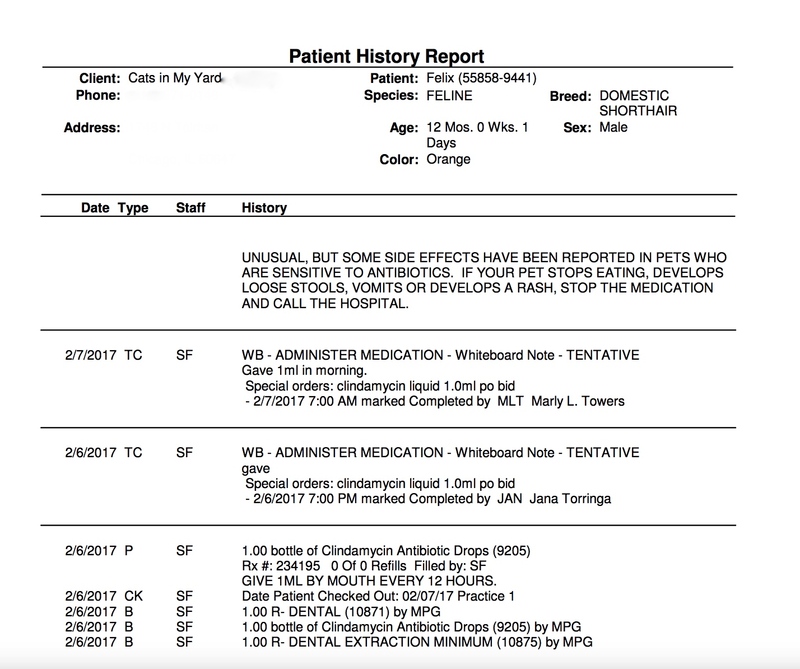 After extensive vetting and a week’s hospital stay, Crystal was humanely euthanized because her biopsy showed she had a malignant cancer. 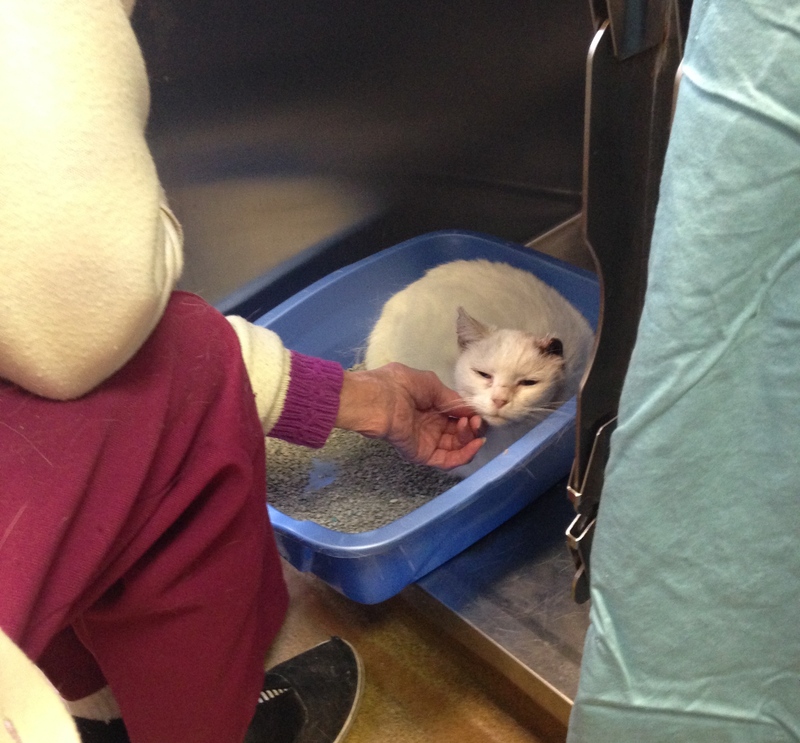 Thanks to all of you who donated towards her care. We couldn’t do this without you! 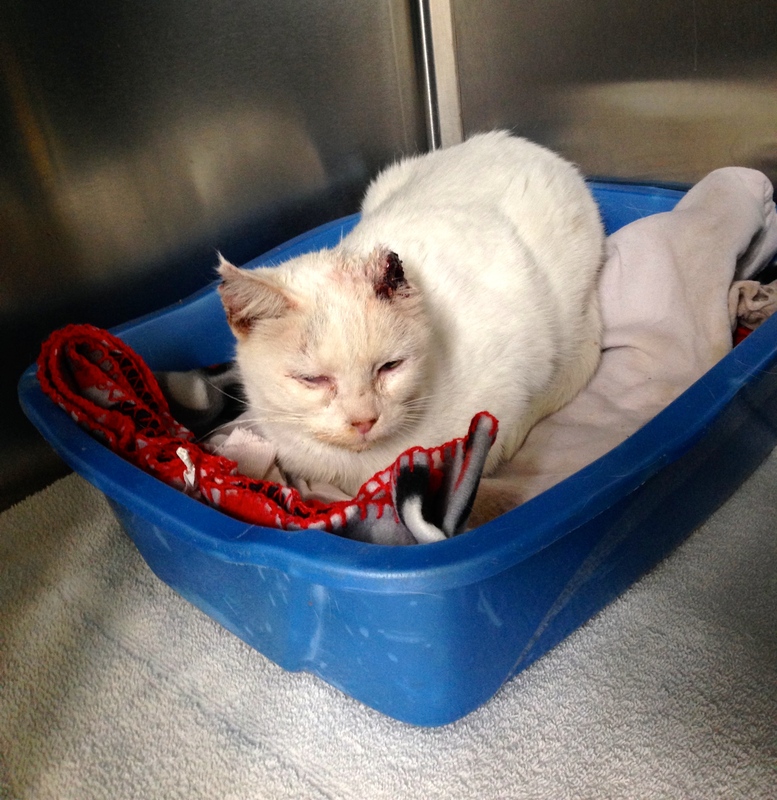 Together we raised more than enough funds to cover Crystal’s care. Thank you: Annamarie F., Barb G., Ben M. and Carolyn T., Cori B., Carla F., Carlin R. and Kathy, Catherine M., Diane D., Elisa G., Heather Z., Joan F., Kristine L., Lindsey P., Lois R., Maryan S. and Oleksandra K., Melody S., Mette P., Mimi M., Paula G., Rita B., Sarah S., Terri V., and Victoria S.! And we know how much all of you do for the cats in your care as well. Every person I’ve met within this group has done incredible amounts of animal rescue. It is extremely humbling. 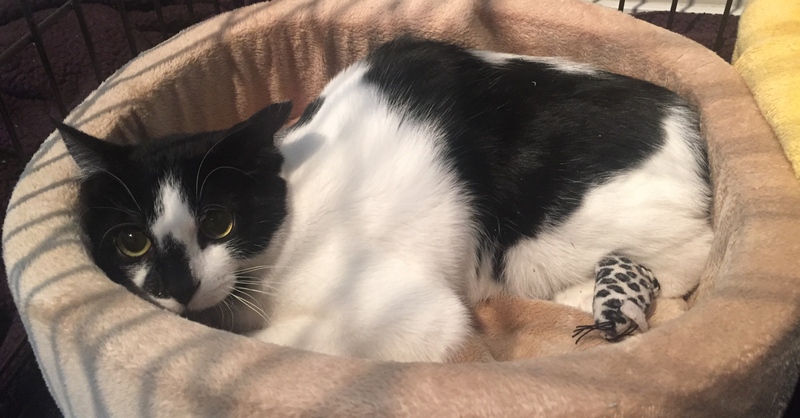 One of you asked about a cat that was coming to your yard with most of his tail missing. 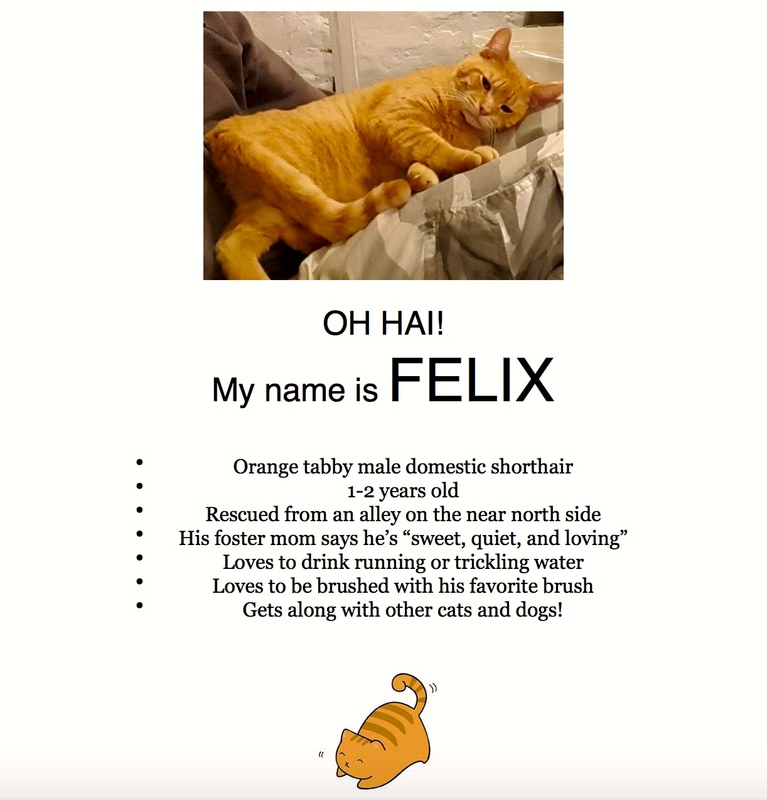 I gave some ideas on where to take the cat, and you were able to get him fully vetted and available for adoption. 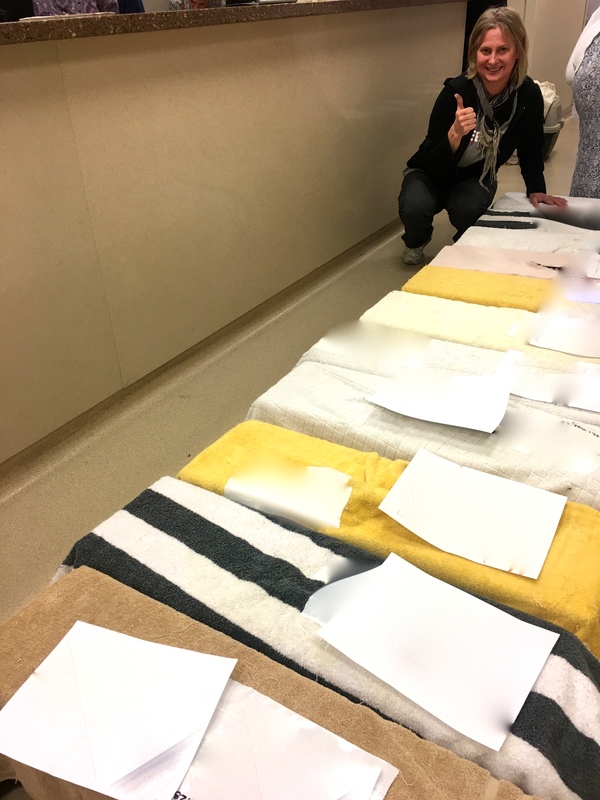 When I saw the photos, I asked to share the story as well. This amazing donor complied, but wished to remain anonymous. That is how wonderful all of you are. I like to celebrate the proactive action of people who go out there, see an animal in need, and try to do something about it. I offered a few suggestions to her of resources closer to her that may be able to help. 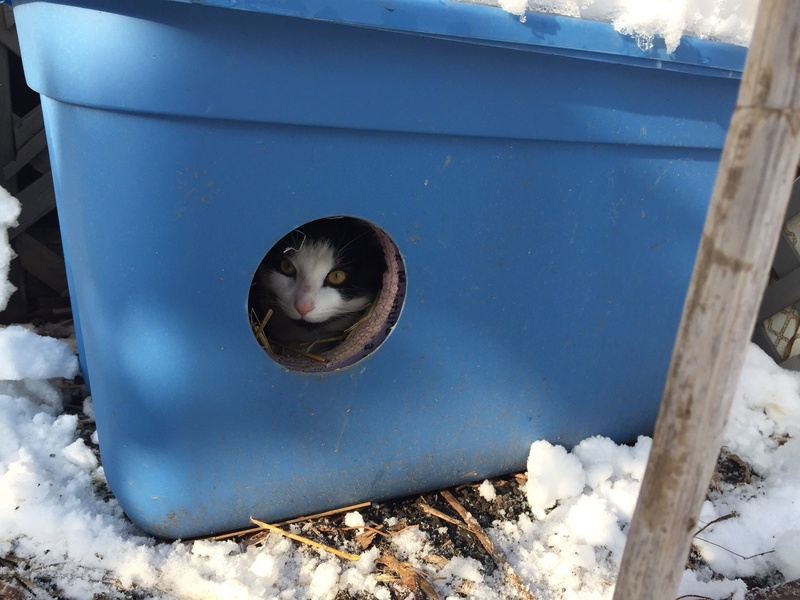 She ran with it, took action on her own, and rescued this cat. 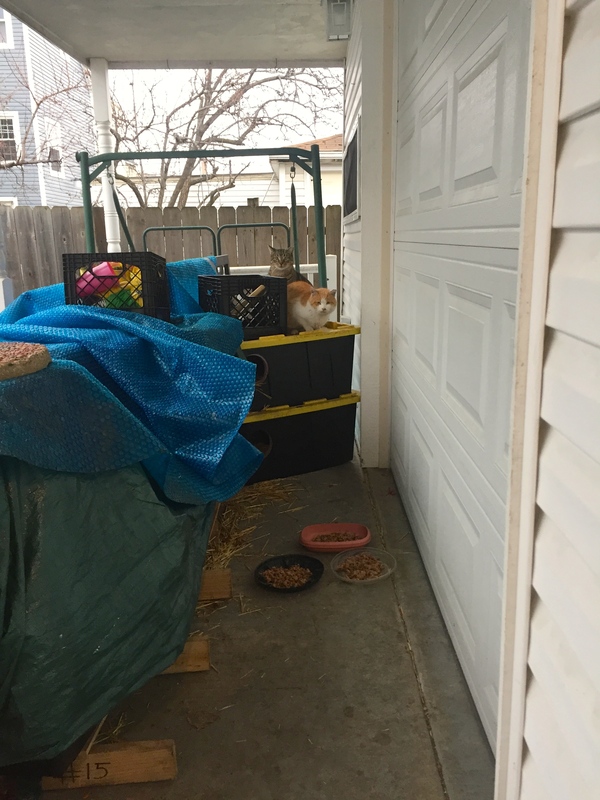 This woman lives in the far northwest suburbs of Chicago and also wanted to remain anonymous because she does not want people to dump their pets on her, or expect the vet she used to always give free vetting. I completely understand the sentiment. 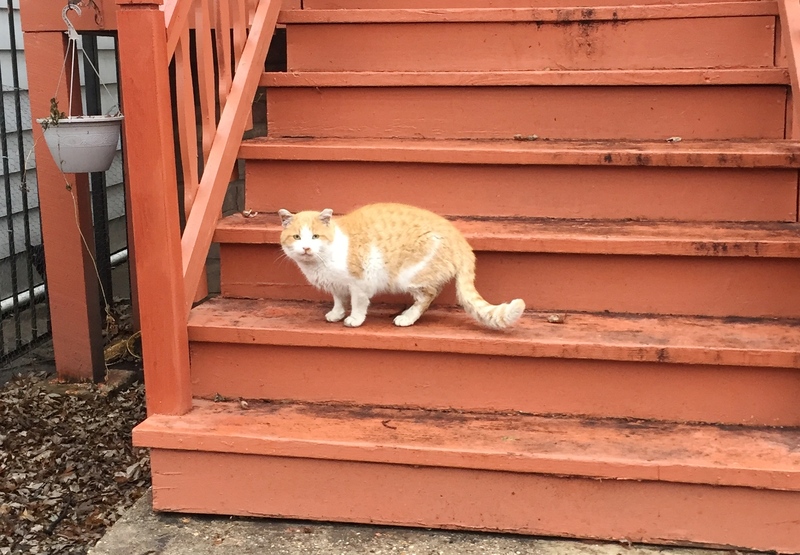 Meet Doc, a cat that started visiting her yard this winter. 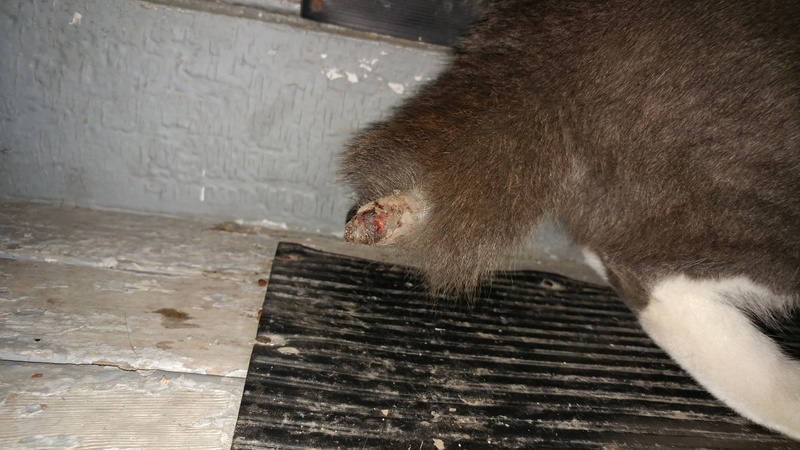 Most of Doc’s tail was missing and injured. Despite that, he looked good and had a healthy appetite. He started to visit her yard for food more regularly. 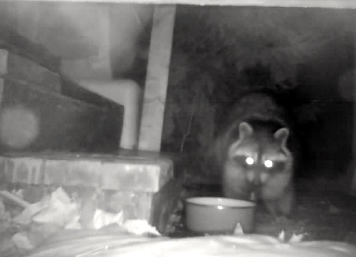 She has a webcam and was able to track his visits to her yard at night. 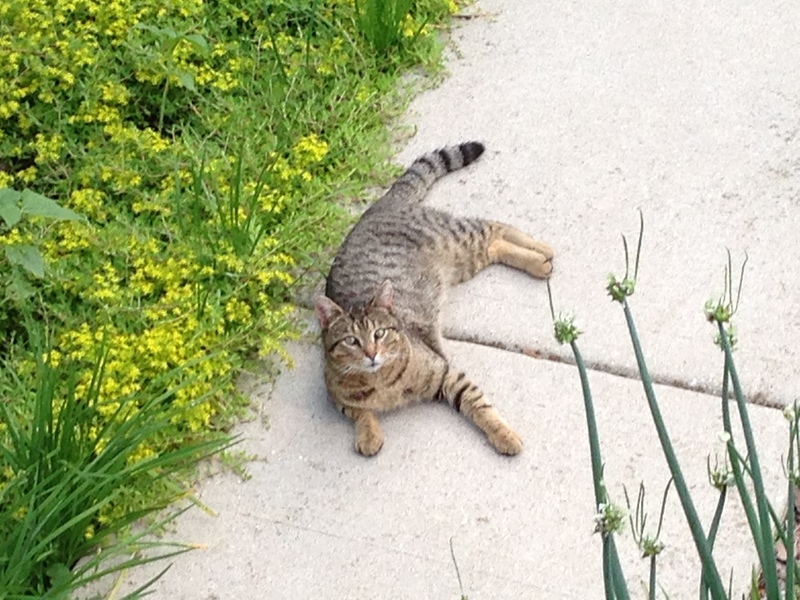 This is another feral cat that was TNR’d three years ago that she feeds regularly. 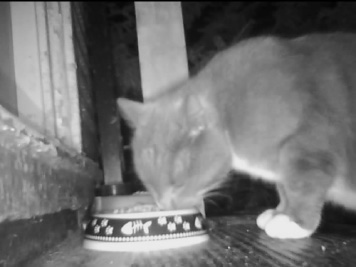 A new pregnant female cats has been visiting recently as well that she is currently trying to trap before she has kittens. 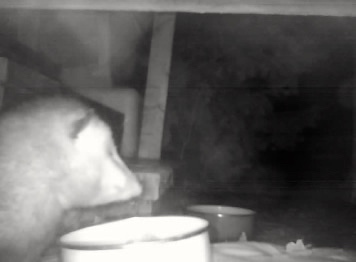 And she also gets visits from other wildlife, such as opossums and raccoons. Doc is friendly, so she tried to put food in a cat carrier but he wouldn’t go in. She also tried a humane trap but that didn’t work either. 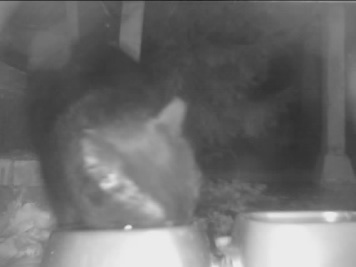 So she opened the back door to her enclosed porch and he went in to eat. She closed the door and Doc panicked a little, but he was more worried about eating. He settled down when she turned a small heater on and enjoyed the warmth. She got him into a dog crate. 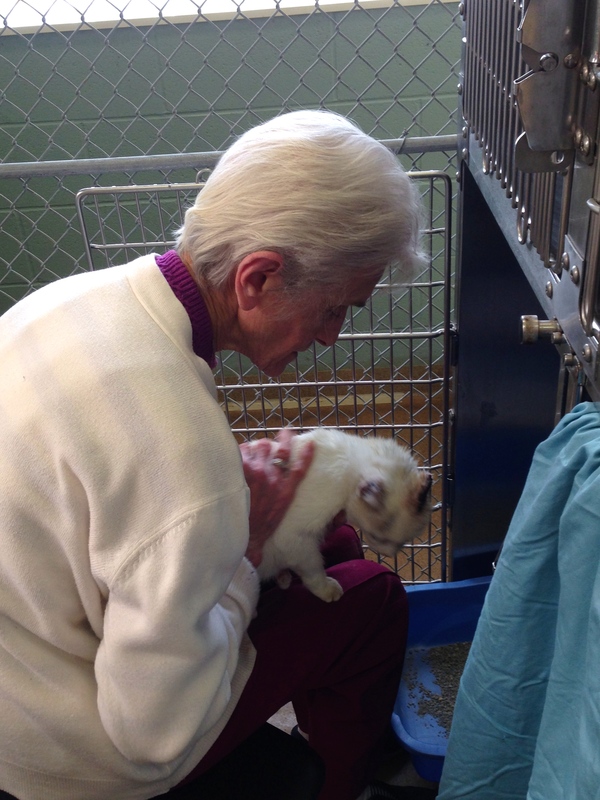 She was able to get him into a vet who also does animal rescue. 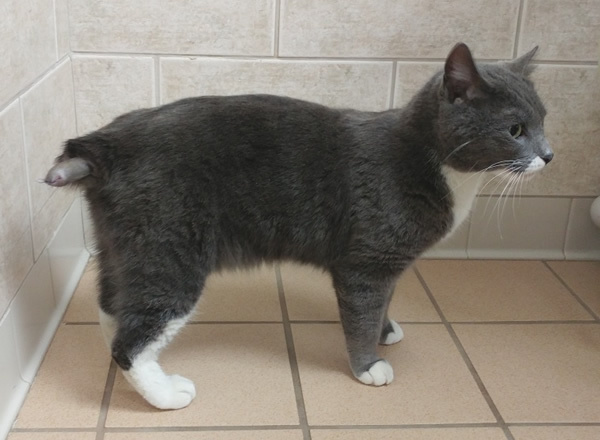 Doc weighs a healthy fifteen pounds, is pure muscle, and is about 3-4 years old. The vet gave him a full exam and cleaned up his wound. Doc was also then neutered and vaccinated, and then put up for adoption after his tail completely healed. He looks great! We are so happy to hear stories like these! Not only is it a happy ending for an animal in need, it showcases how people can network together and get things done. More animals will be saved with more people being proactive on their own. 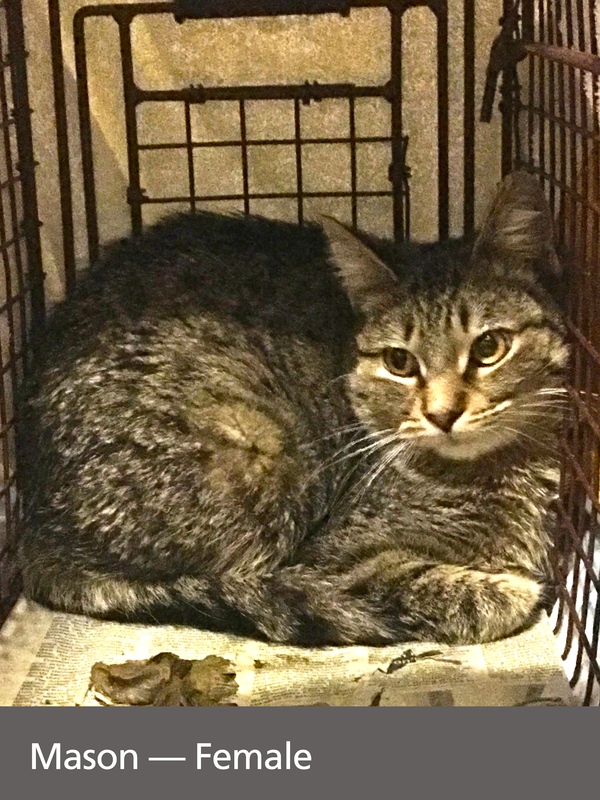 Joann found the Land Colony last summer in Avondale while we were TNR’ing all over the place there during the height of kitten season. Margie and her husband, Pepe, were feeding the cats in their yard, and there were just too many. 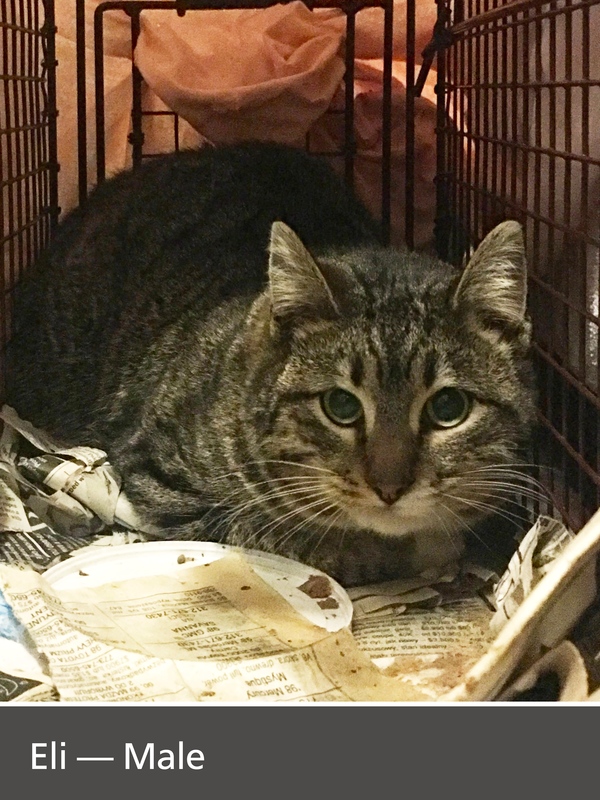 Joann saw several two-month old kittens. Margie was on board with TNR, but Pepe was not at the time. 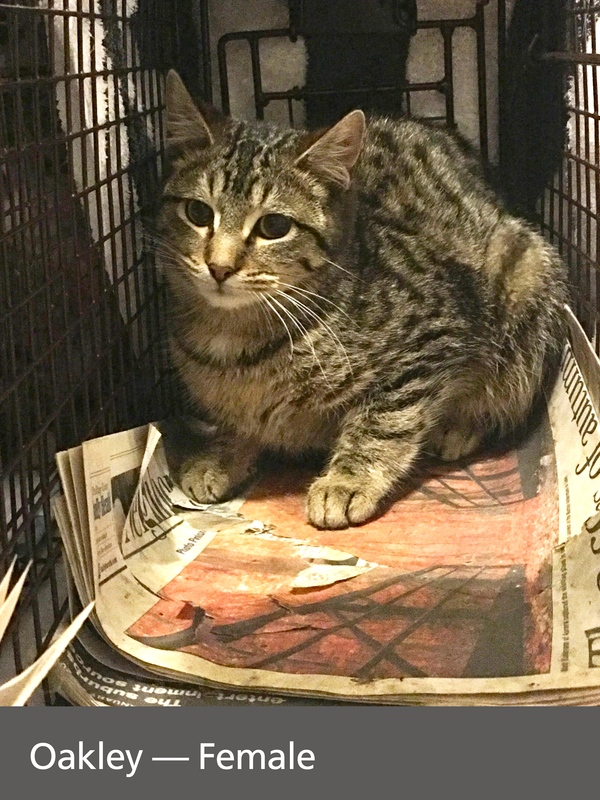 We moved on to do TNR and foster kittens from several other colonies in Avondale. 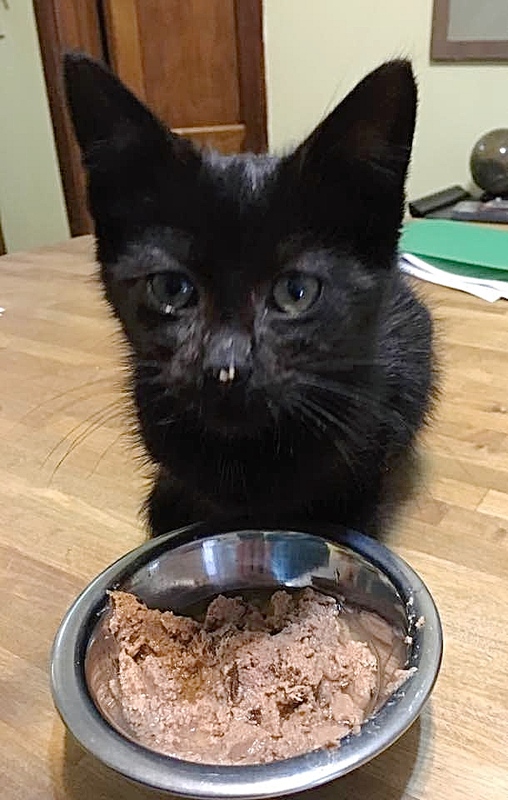 We don’t know what happened to those kittens in the photos, but Margie called us a month later because she found yet another sick kitten in her yard. Simon had a URI and was infested with parasites. He was starving and underweight. Obviously he was also super cute and friendly. His rescue was a group effort from all of our friends from start to finish. 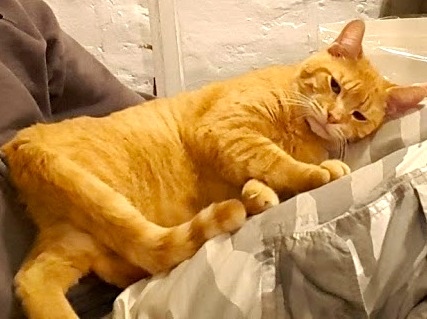 We fully vetted him at Joann’s vet, our friend Elissa at Rockstar Pets fostered him, and he was eventually admitted into PAWS Chicago’s adoption program. 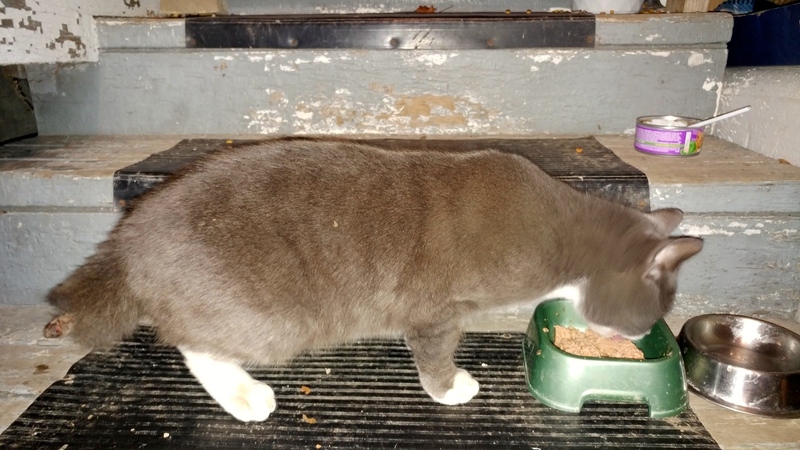 And then, on another twist of amazing fate, my TNR friend, Trudy O., saw Simon’s story and shared it with her neighbor. Her neighbor adopted Simon along with another kitten together there! So obviously there were a lot of cats that Maria, Pepe and others were feeding, but we weren’t allowed to TNR yet. We were still in contact with them while we had Simon to let them know everything that was happening, but Pepe still did not want us to trap the cats. 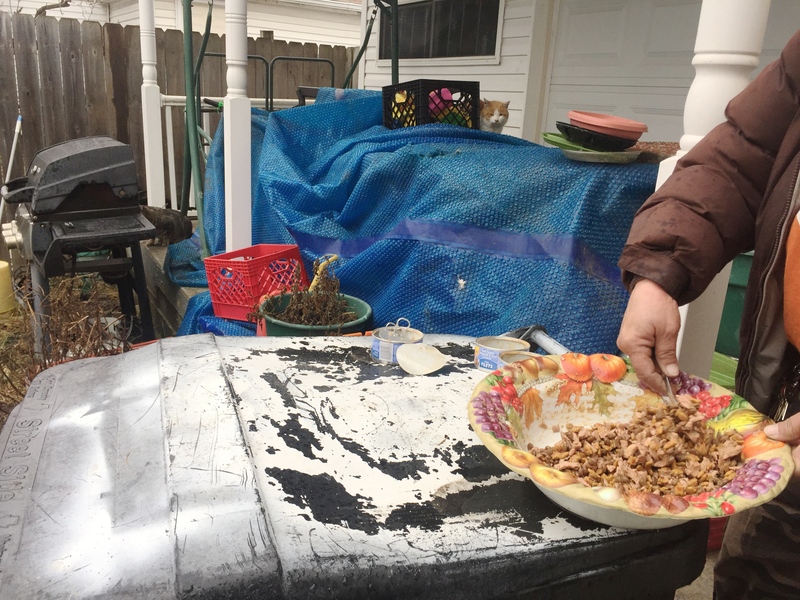 Fast forward to last week, six months later, when Kim V. and Nellie J. heard about this colony again because neighbors complained to animal control. This time, Pepe was more on board with TNR although he still is worried. 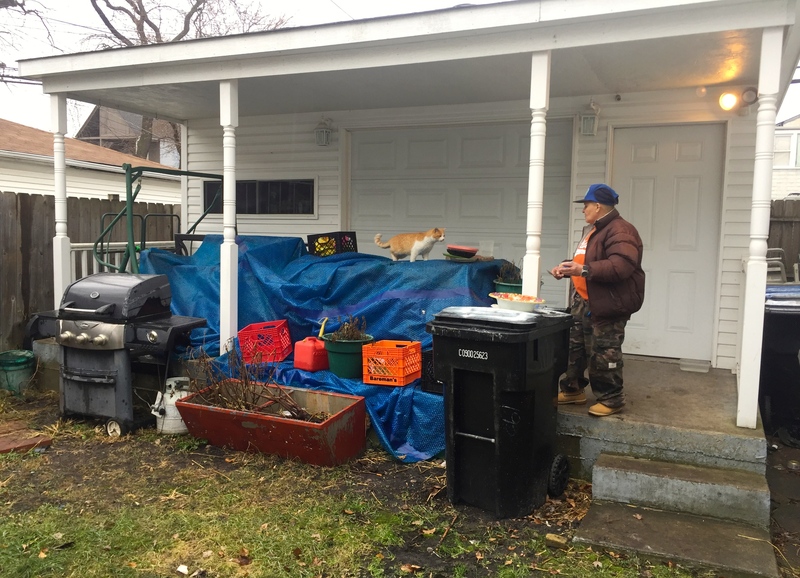 Kim and Nellie talked to him, Maria, their daughter, and tons of neighbors around the area who all feed the cats. Everyone loves the cats, feeds them, and wants them around to control the rats. No one wants the cats killed. But it’s the same old story – there are just too many of them. 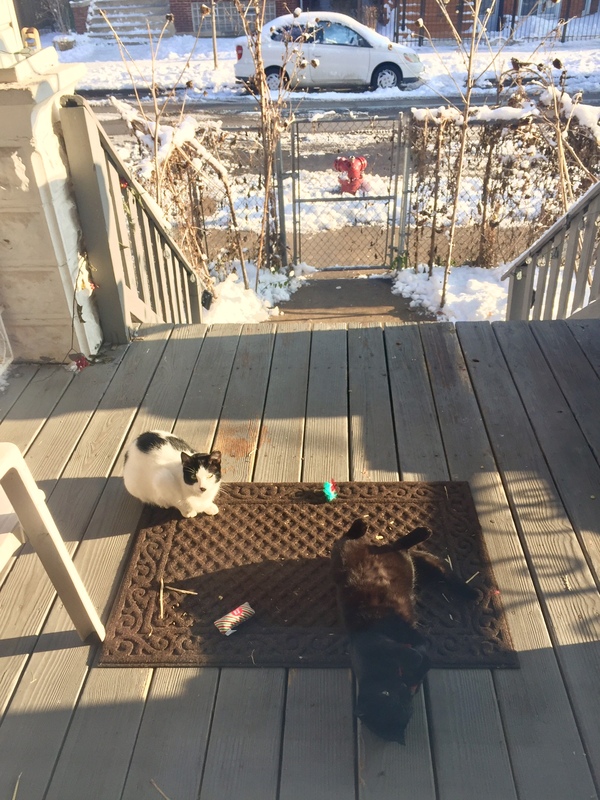 Maria and Pepe found kittens dead in their yard this winter, frozen from the low temperatures. They were realizing that they had to do something. 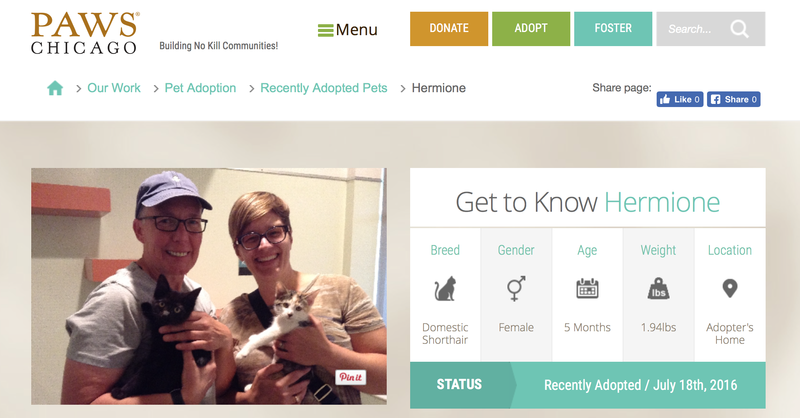 Kim and Nellie were now allowed to freely TNR. 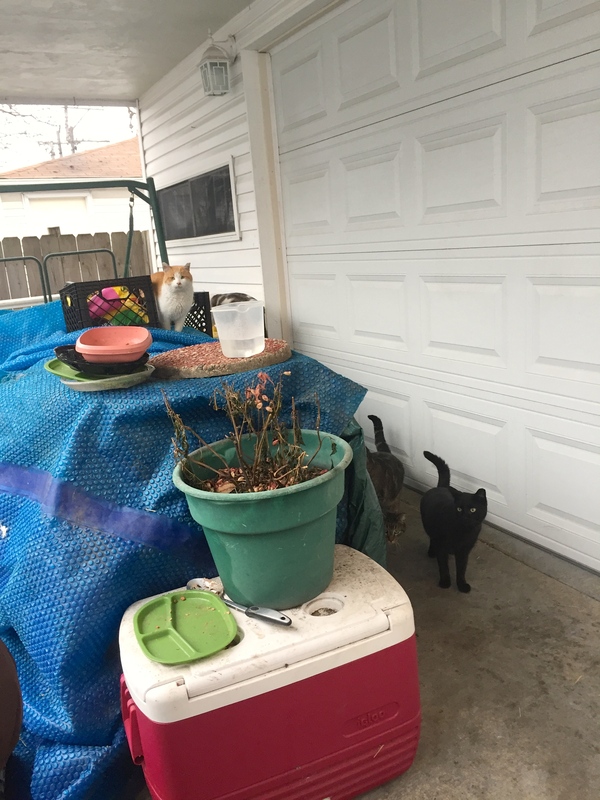 Last Friday night they showed up, and trapped 11 cats in just a few hours. They could have trapped at least a dozen more, but they ran out of traps and only had a set number of appointments.. 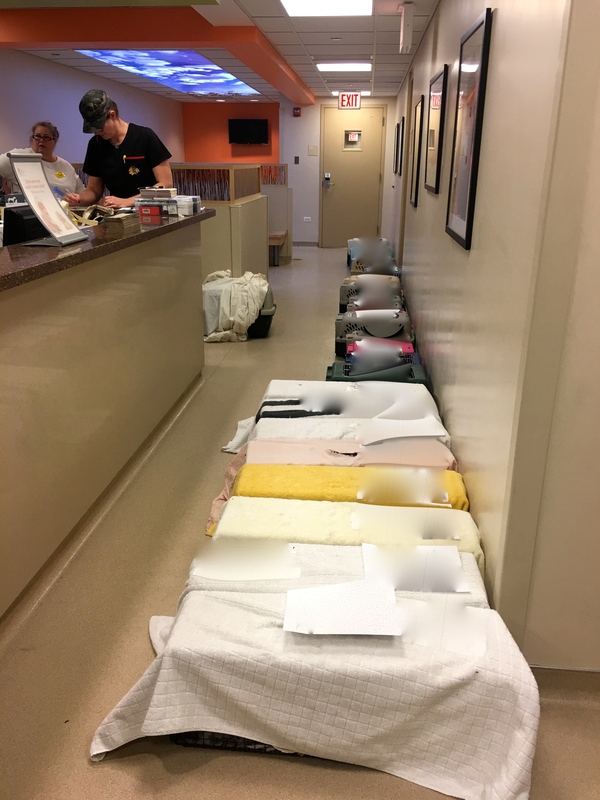 They brought all of the cats to Anti-Cruelty Society for their TNR surgery. A LOT of cats were brought in that day for spay/neuter surgery. THANK YOU, Nellie and Kim! 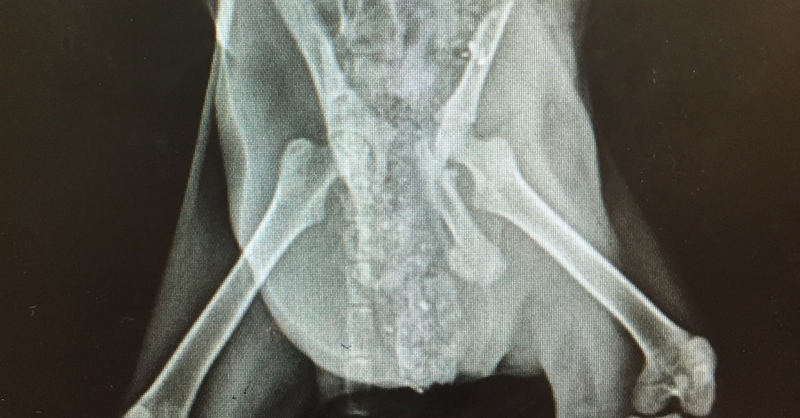 They think one of the cats miscarried in the trap before her surgery. 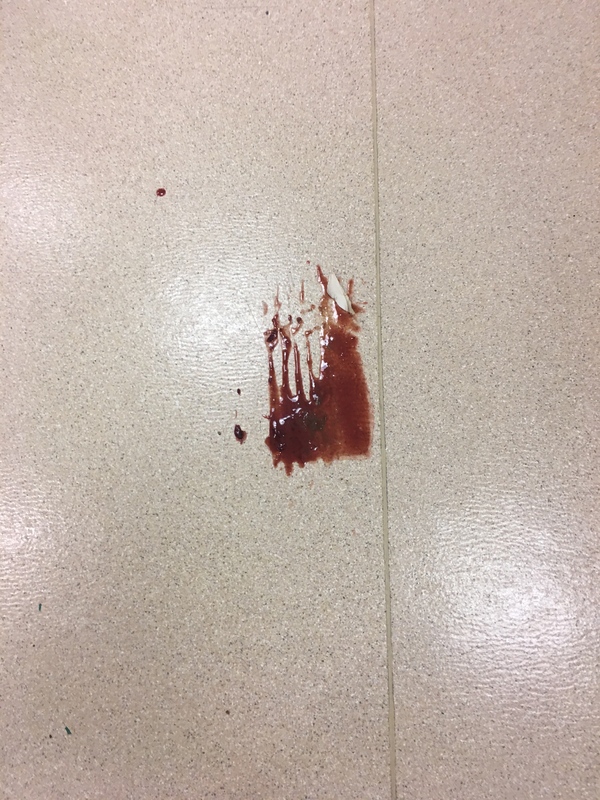 Kim saw this when she picked up the trap off of the floor. Out of the eleven cats, eight cats were female, three cats were male. Two of the female cats were pregnant with ELEVEN kittens total. Can you imagine if ALL eight females were pregnant? With those rates, 40-48 kittens would be born there this spring from just this bunch. Not to mention the other females still not trapped. 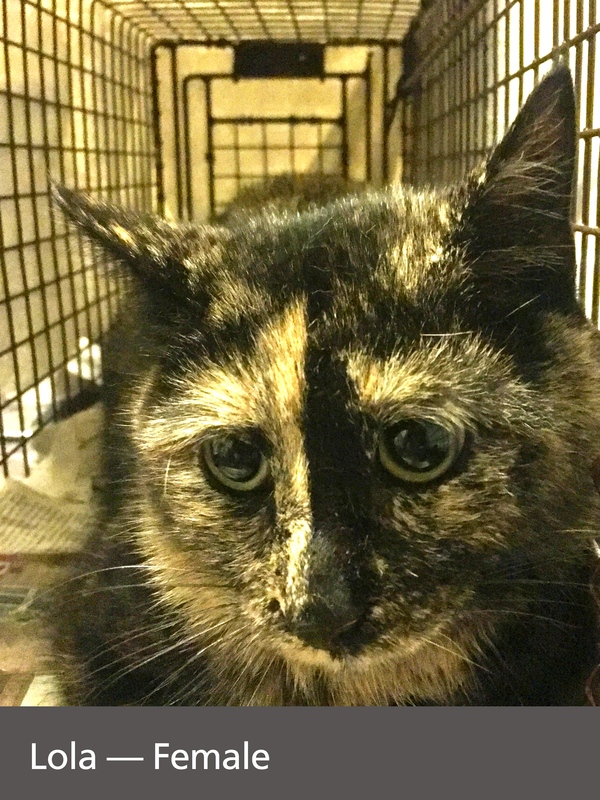 You can see in the photos below Kim and Nellie trapped three tortie cats that night, but they saw at least five more. 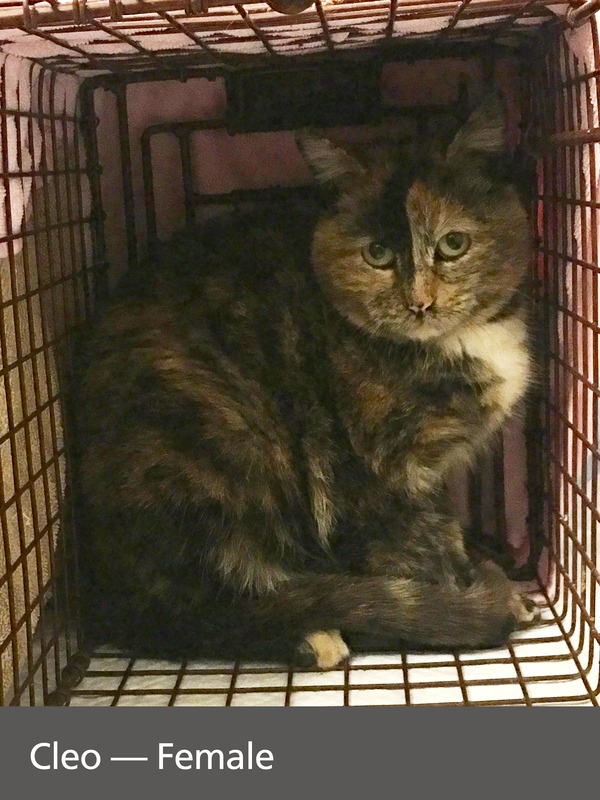 We all know tortie cats are female. 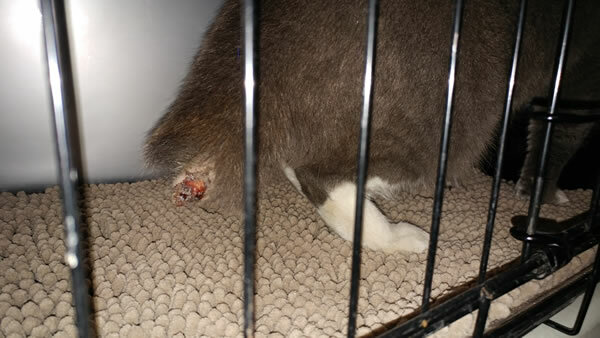 All eleven cats are currently recovering and doing well in Kim’s recovery space. 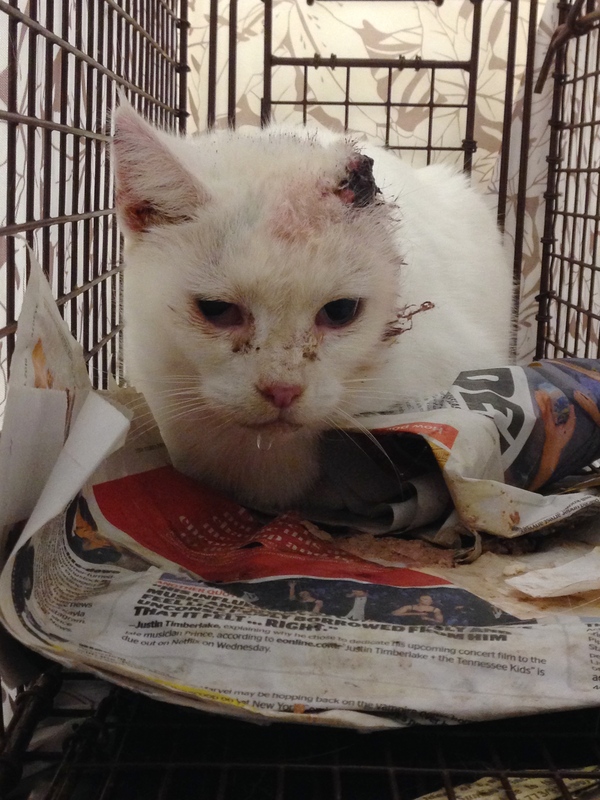 TNR and colony care and management doesn’t stop there. Kim and Nellie took it upon themselves to show everyone how to properly care for the cats afterwards. 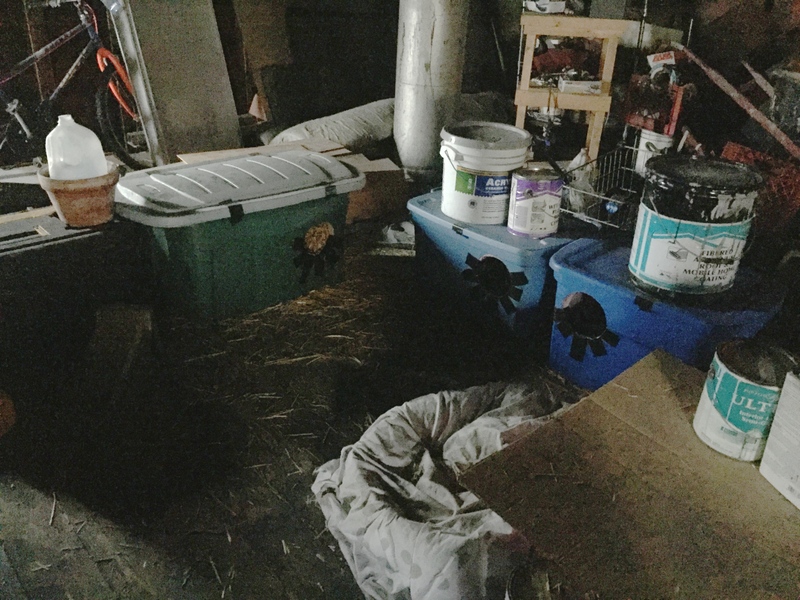 Currently the only shelters the cats have are cardboard boxes with plastic tarps and towels. Kim and Nellie are going to help them provide better shelters. 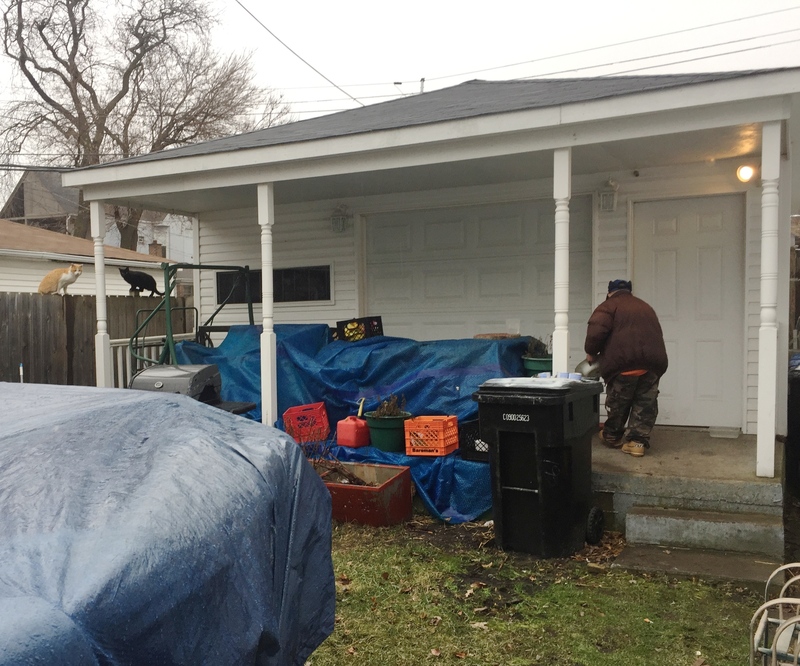 There are also outdoor electrical outlets so we’re hoping Maria may be able to provide electric outdoor warming bowls for food and water, and perhaps even heating mats for them to lay on. In the meantime Maria has also asked about costs for everything, and is even interested in possibly throwing a fundraiser for the cats. We’ll keep you posted if they do! 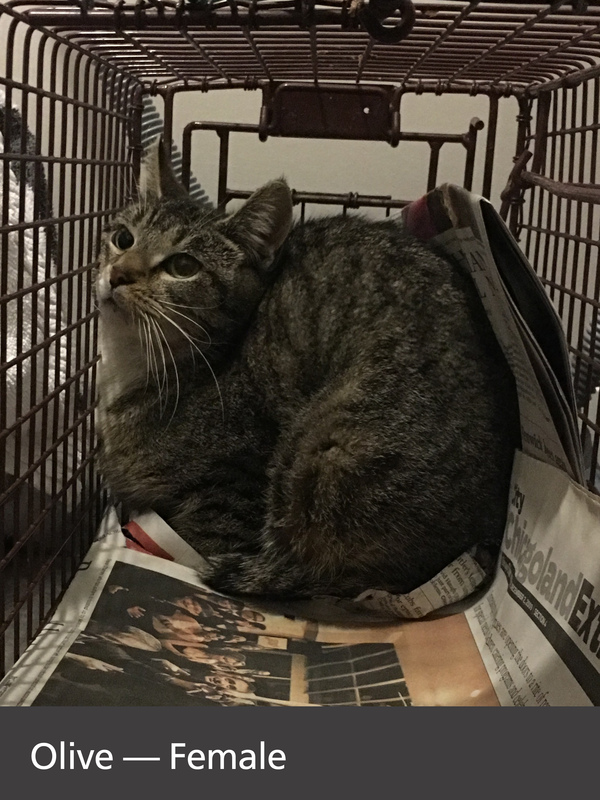 Maria has also agreed to register now as a feral cat colony caregiver in compliance with Cook County’s Managed Care of Feral Cats Ordinance. Kim will be returning the cats there this week, and trapping again. 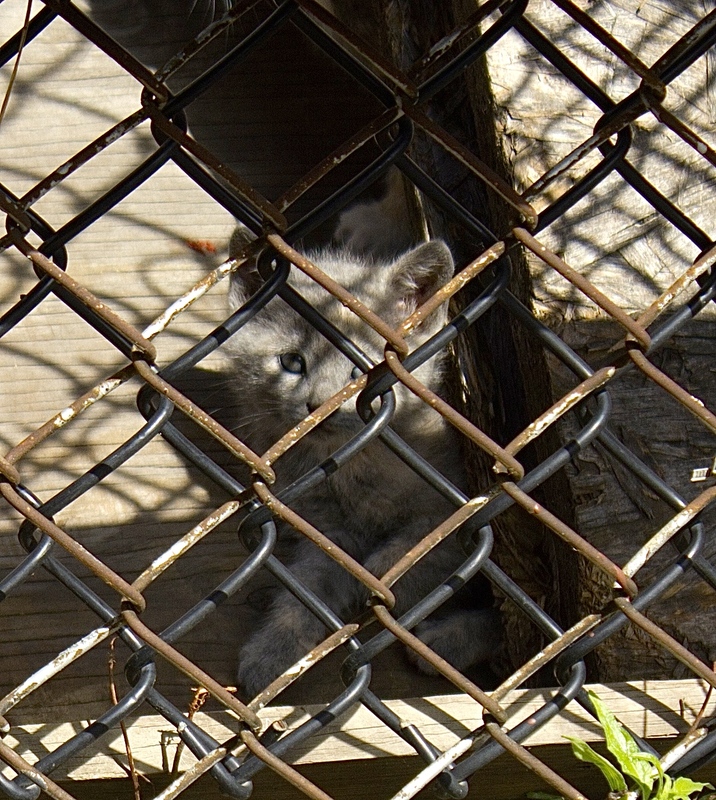 We think once the cats are returned, then EVERYONE there will see how much the cats thrive and are better off with TNR. Kittens won’t be born and dying. 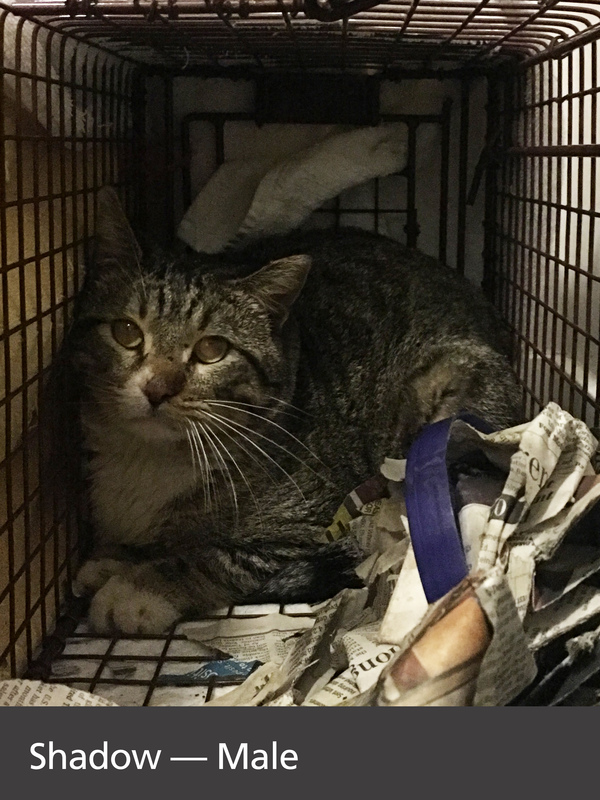 The TNR’d cats won’t roam to mate and fight – they will remain to eat in their own territory. Kim is also talking to Maria about establishing set feeding times and a feeding station for the cats so they will all see how many cats they have and how much to feed. Persistence, patience and follow-through is crucial to not only trapping cats, but also in working with the feeders. Sometimes it can take months and YEARS to get a feeder on board. Communication is key, and sometimes you have to walk away for a bit. There’s always more to be done with people who want your help. And then later you can come back and ask again. We are very excited about this change of heart and hope the momentum continues. 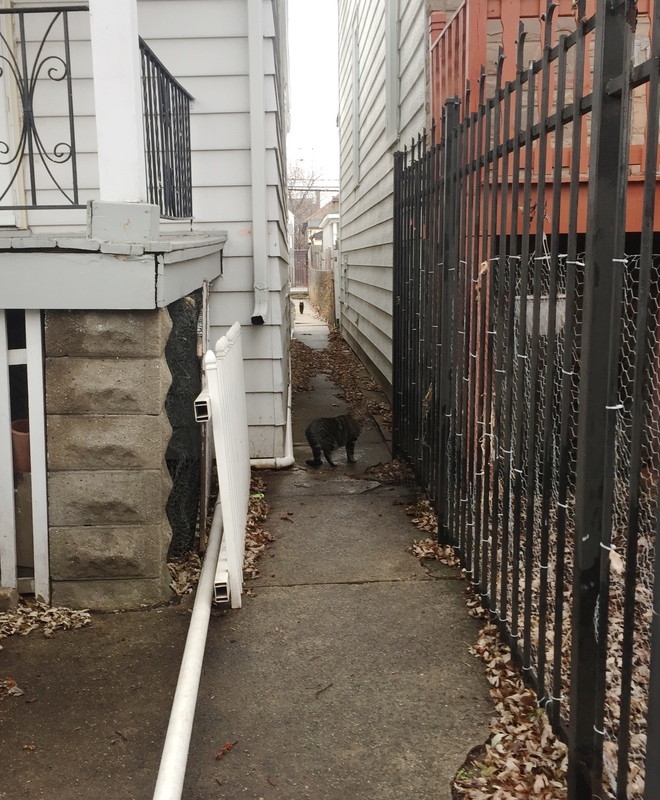 Edda is a 60-year old woman with limited income and means caring for up to 20 cats in the Hermosa neighborhood of Chicago, an area filled with cats. 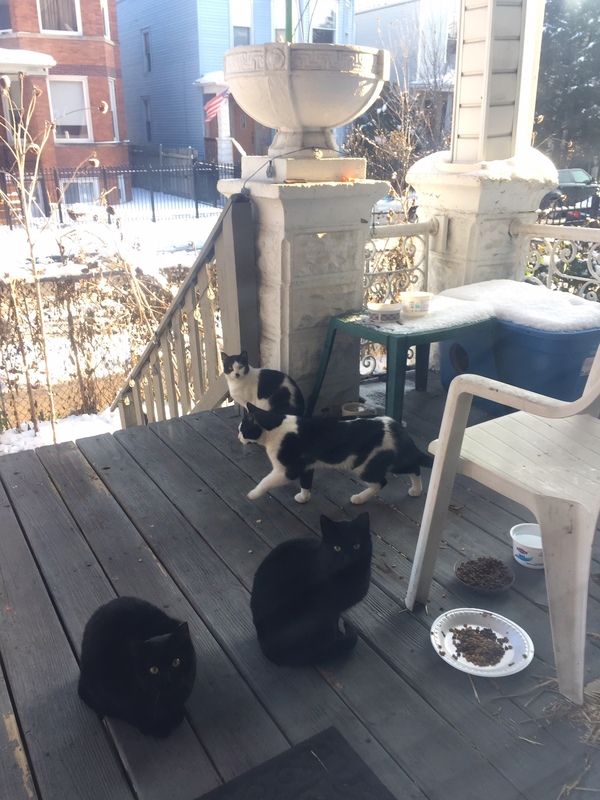 This is a very common scenario on the west side of Chicago and all over for people who feed cats. 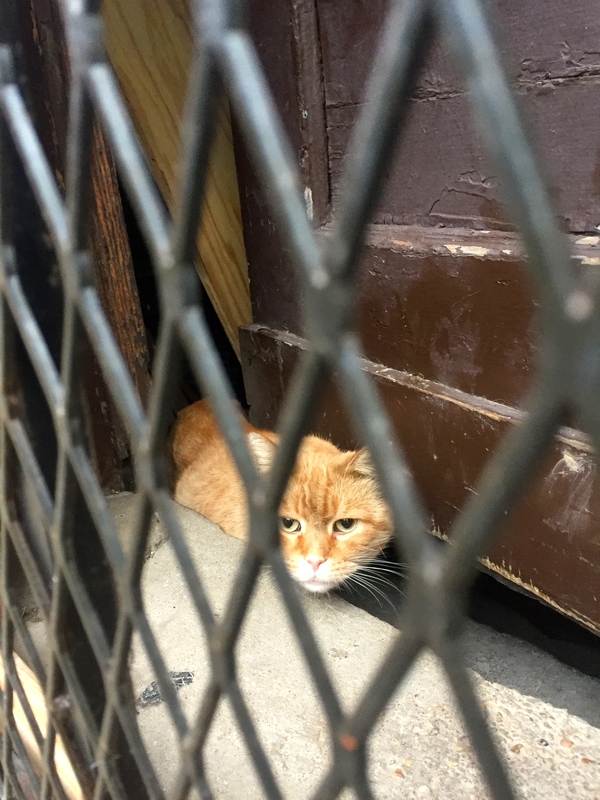 My TNR friend Oleksandra told me about Edda when I asked her if she knew of any cat colony caregivers who needed extra cat food and supplies. 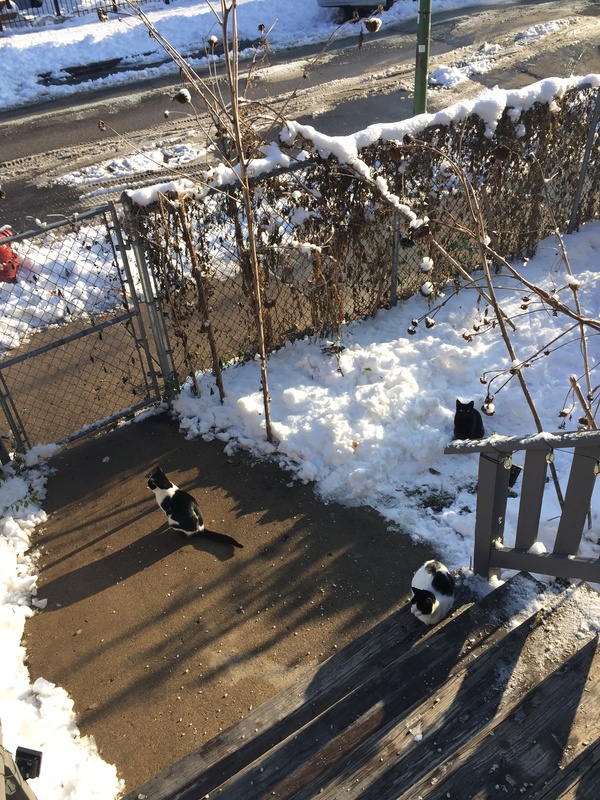 Edda’s outdoor cats were all TNR’d by Oleksandra, Erica and Brianna a few years ago. 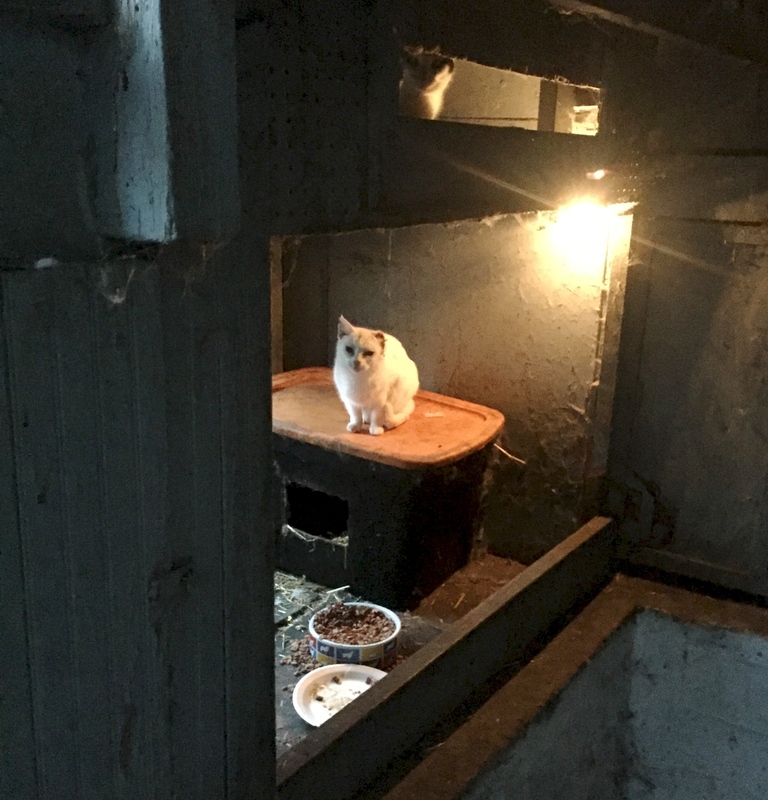 Since then Oleksandra keeps in touch and helps Edda care for the cats, including additional vetting, since they live close, along with many other TNR’d colonies. I met Edda this week with a delivery of cat food, an electric heated food/water bowl, and a bale of straw for her outdoor cat shelters. Thank you to all who have donated their extra supplies to us! This is an example of where they are distributed to. Edda gave me a tour of the cats that she cares for. Every cat I saw was ear-tipped. I was impressed by that but not surprised because I know how thorough Oleksandra is when it comes to TNR. I want to reiterate again that this is a common scene people run into with TNR. 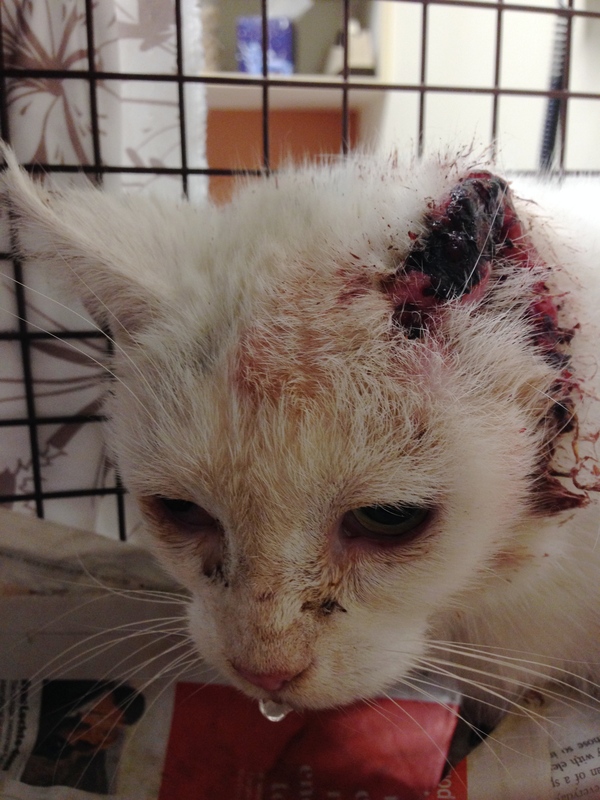 Caregivers and feeders do what they can with what they have for these cats. 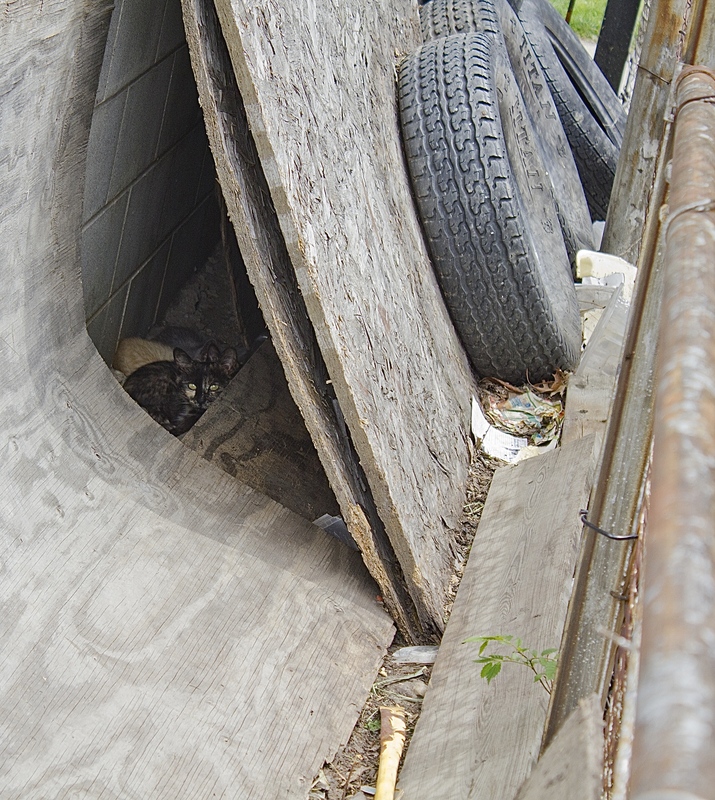 TNR is not just about helping the cats – it’s also about helping people and the community. 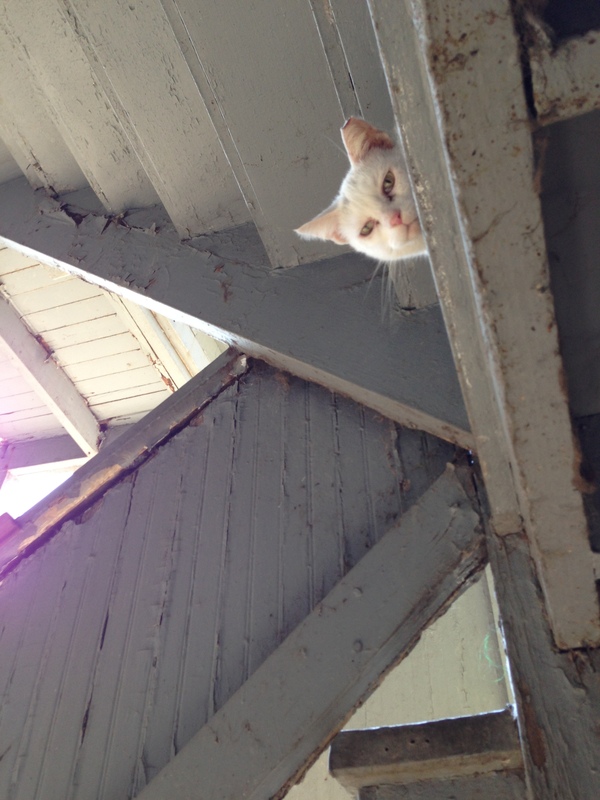 Edda has five cats living in the basement of her apartment building. 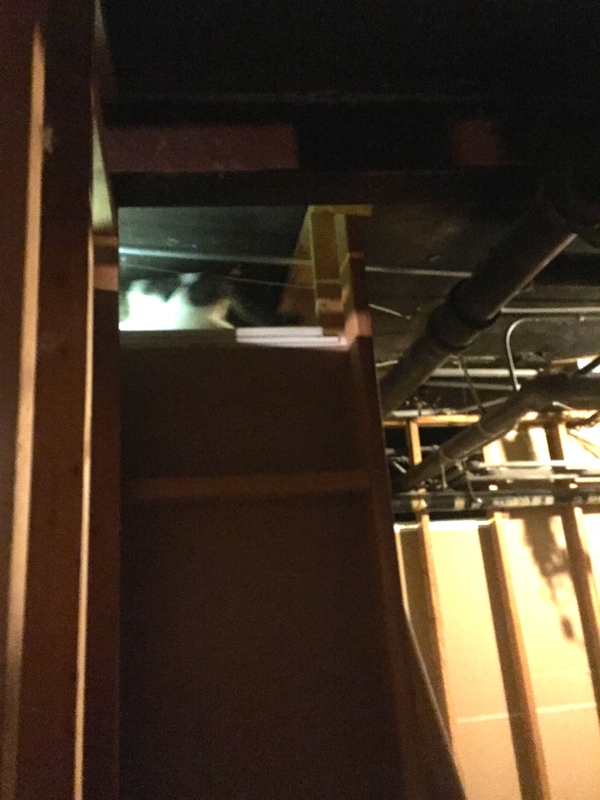 I only saw one because they are semi-feral and go up into the rafters when they hear people. 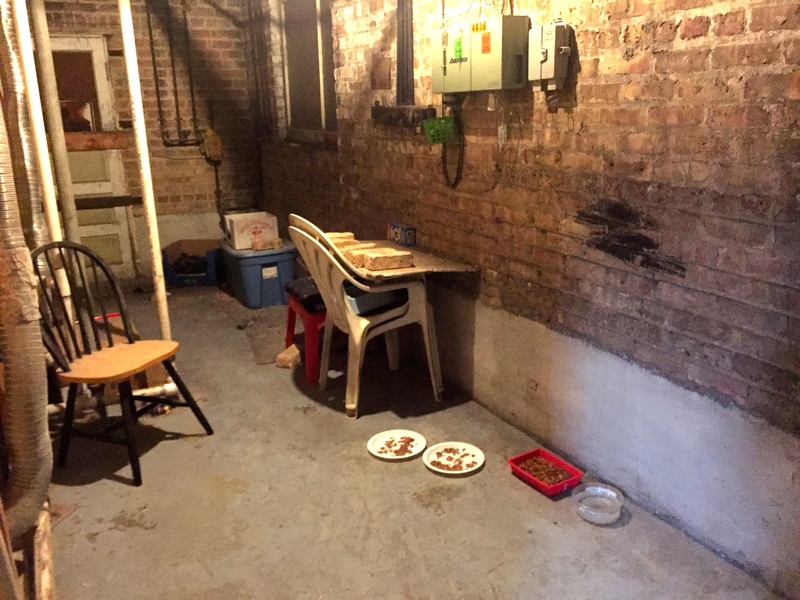 This is the feeding station in her basement, with cat shelters in the back. The cats can look out the door when it’s open. Edda does not want to let them out because she said there are people who live around there who abuse the cats. This is why she brought them in in the first place. Now she’s worried about finding them homes because she worries what will happen to them if she has to move. 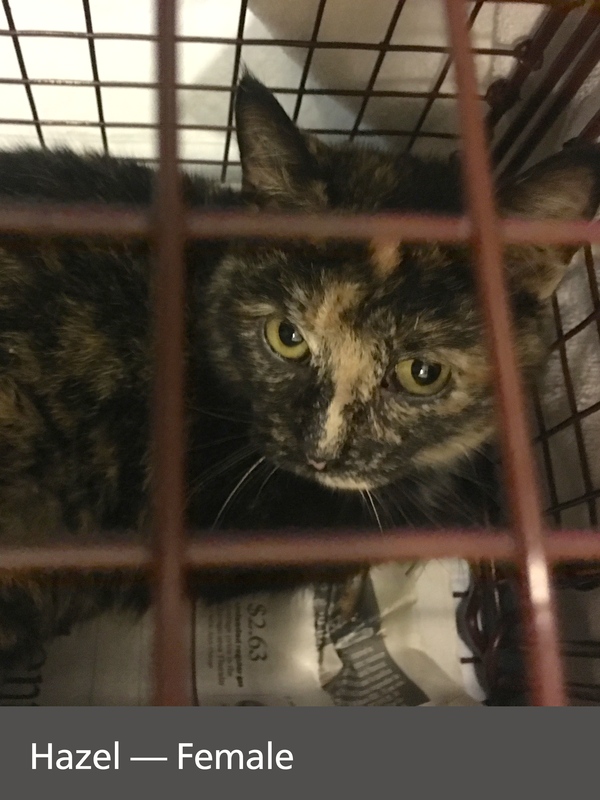 She said she is not well and has already refused going to the hospital because she worries about what will happen to the cats. 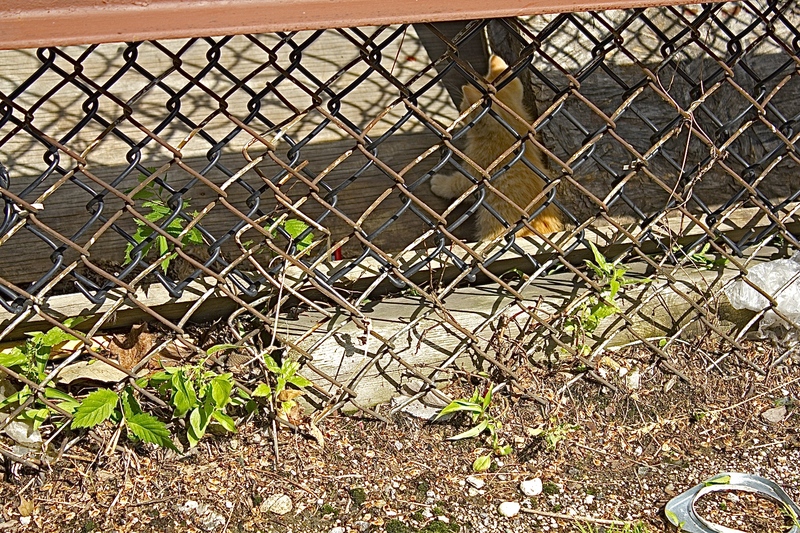 Another one of her TNR’d cats lives in the basement next door. He has to be kept separate because the other cats will fight with him. She also cares for a cat across the alley. He is at the bottom of this photo by the cars. He has shelter inside that building, at the top of the stairs where the door is always open. 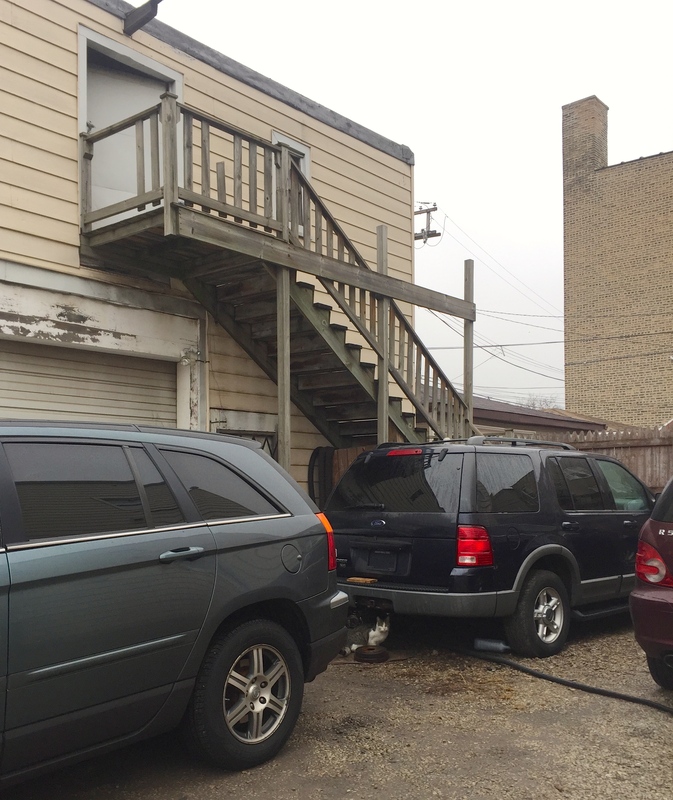 Edda has permission to access to this building. The stairs are extremely rickety to navigate for humans. Inside are multiple cat shelters for him and any other cats to use. There used to be another black cat here that got very sick. Oleksandra took him to the vet last year and he was treated for awhile, but ultimately had to be euthanized. There are several raccoons that also go there. 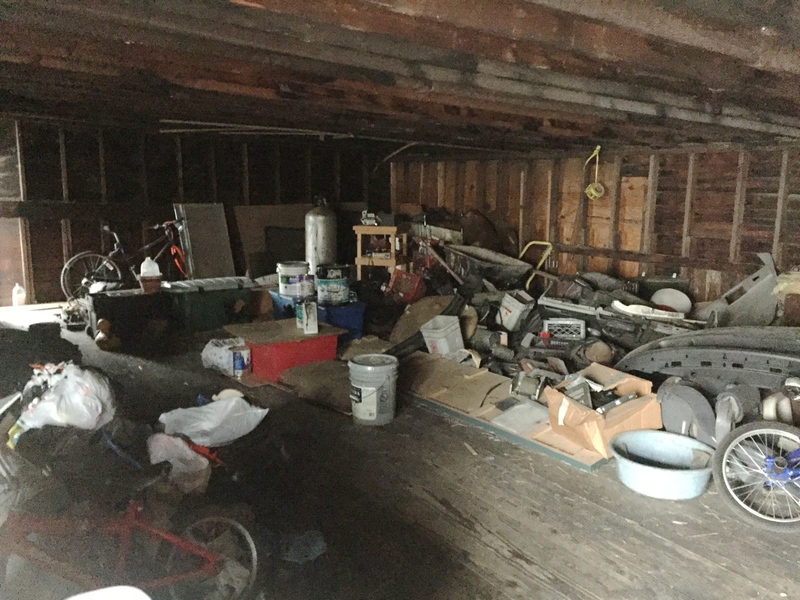 Here’s a wide view of this room, with the shelters towards the back. Edda also feeds a dozen or so cats across the street that live in a woman’s yard. As soon as we started walking towards this house, we saw the colony running around outside. Edda thinks this cat, Mario, is sick. Obviously I’ve never seen him before so I don’t have a comparison, but he did look disheveled. Otherwise, he moved quickly and has a very good appetite. I gave Edda antibiotics that I got as a donation (thanks, Melanie!) to try for him which might help any infection he may have. If he still looks sick after that, I offered to take him to the vet for her. 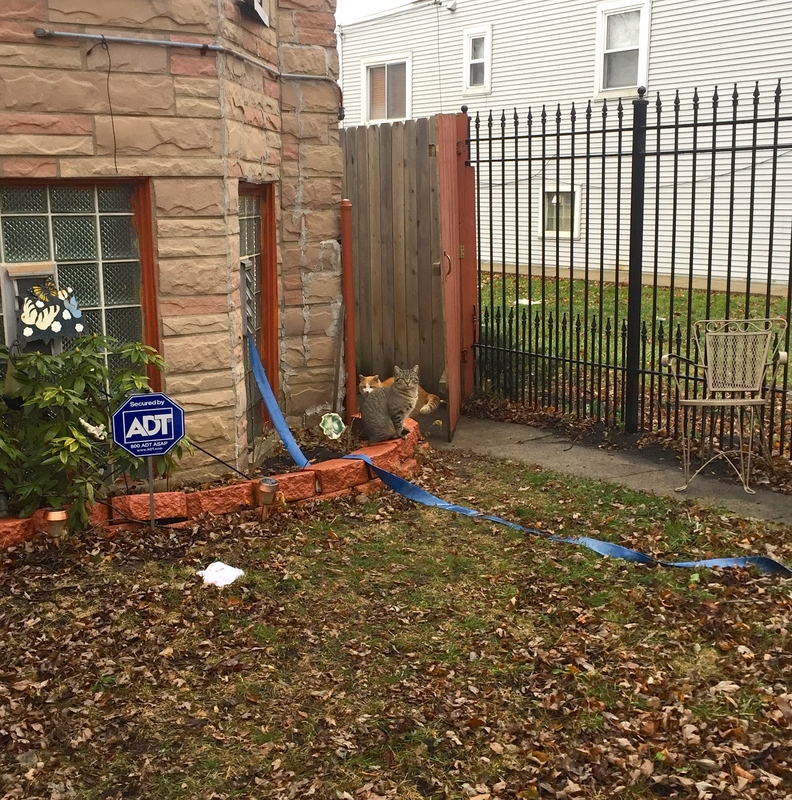 The woman who lives there also feeds, and has outdoor cat shelters underneath the blue tarp. As soon as Edda started getting the food ready, the cats came out, jumping the fence towards her. And waited impatiently, wondering who I was. Mario was first in line. Seriously, look at him creep behind her! The other tabby on the left below only uses three of his legs. One of his back hind legs is held out in the air. 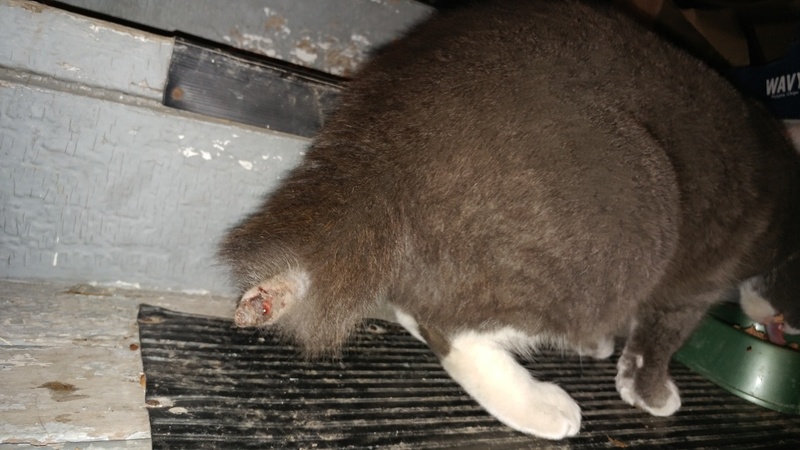 He was like that when they trapped him and they’re not sure how closely the clinic looked at his leg when he was TNR’d. But he’s been like this now for three years there, so whatever injury he had would have healed by now, or it’s a birth defect. He can’t run very well, but he obviously knows how to survive. Nevertheless, I did tell Edda that we could take him to a vet as well for another look, but it should wait until warmer weather in case a procedure is needed with a long recovery time. It’s too cold to be putting a cat back and forth outside with unnecessary stress. 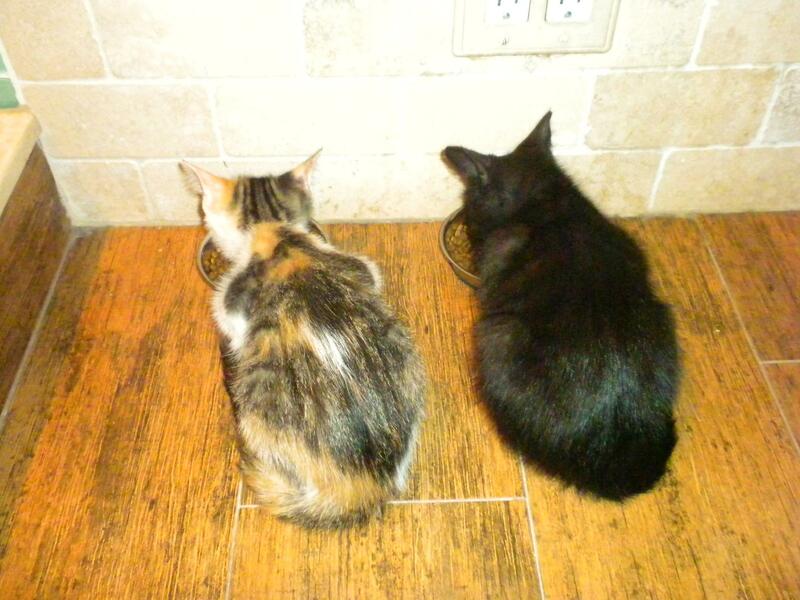 Still wondering who I am… the cats waited until we left to eat. I have to believe that in time what is being done in your area will indeed be done in Rockford, Illinois and every other city where sentient beings with so very much to offer instead suffer silently. Thank you for the kind words, Amanda! And thanks for everything you do for the cats! 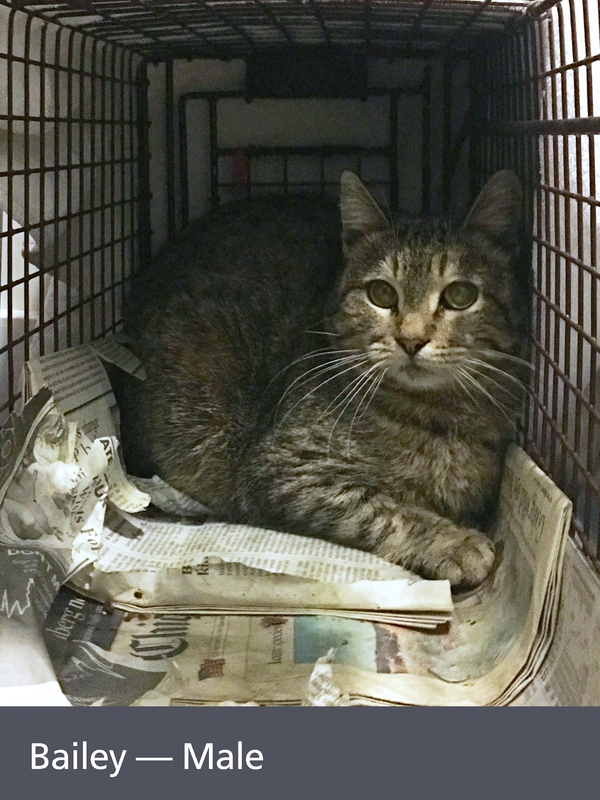 Kim and I helped Melanie TNR her Avondale colony just over two months ago. 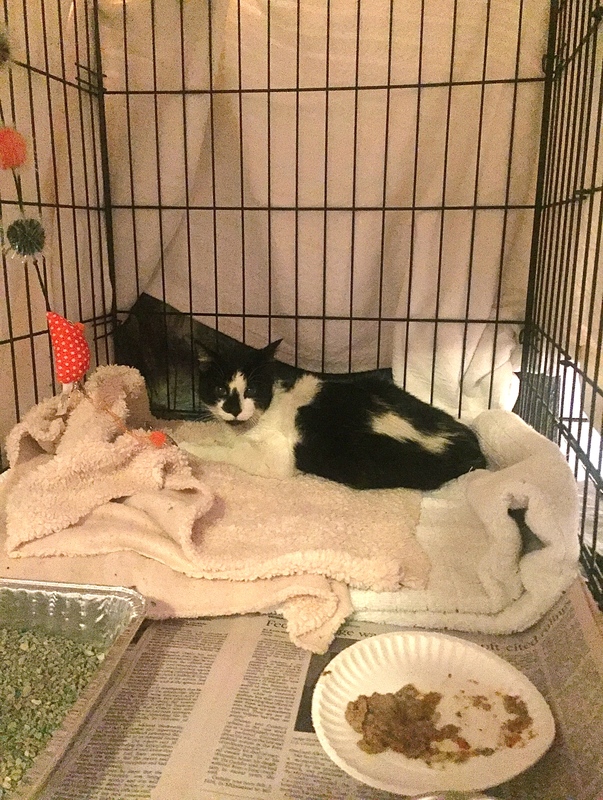 We trapped 17 cats in one weekend. That’s way too many cats, which is why Melanie contacted me. 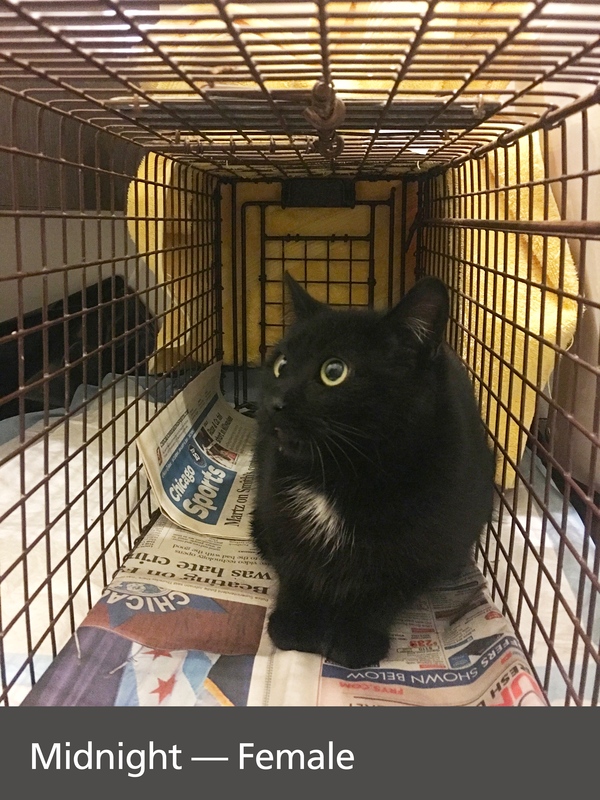 Five of those 17 cats are no longer on the street, including four kittens admitted to PAWS Chicago, and Cowbella, who is being fostered by Kim and currently available for adoption. 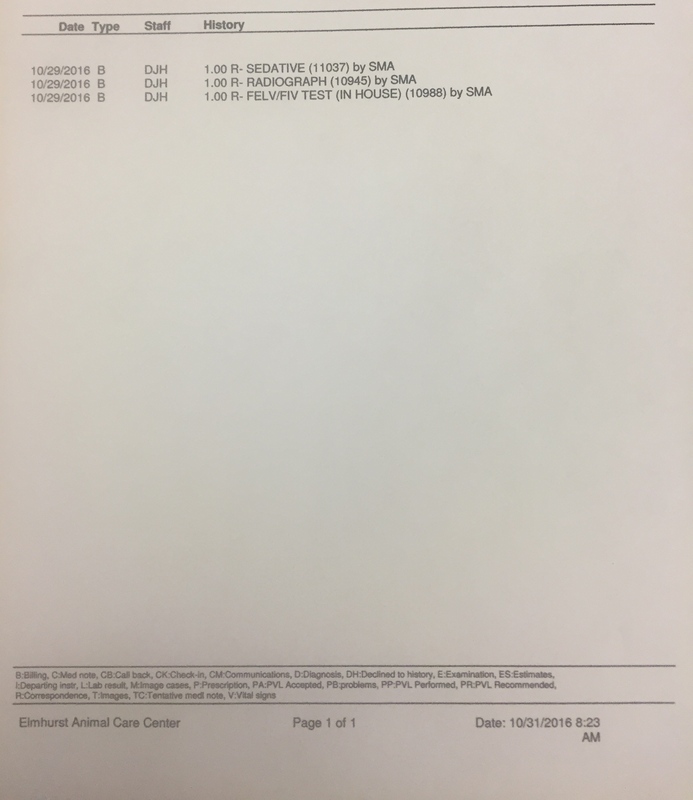 That’s an immediate almost 30% reduction in the size of this colony, not to mention all of the cats that will no longer be born from the female cats and Katler, the queen mama supreme cat. Katler was named after her cute little Charlie Chaplin mustache, and then we named the colony after her. Since then, Melanie sent us updates and photos on how the colony is doing now. We LOVE updates! Katler is still the star. Here she is now in the back, surrounded by her grown litters. Or, as Melanie describes them, looking like a rock band, called: Katler and the Kittlens. And then they like to ham it up all over her yard. 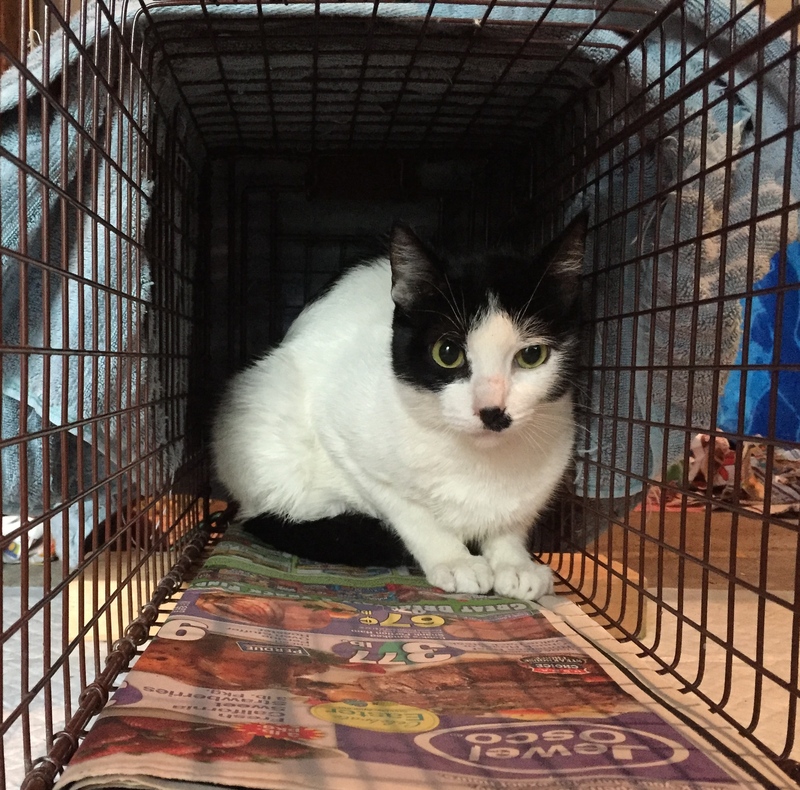 Since their TNR Melanie asked us to purchase cat shelters made out of Rubbermaid bins for the colony. Chinny enjoyed his immediately. Melanie also included an extra donation to not only cover the price, but to use to help other colonies. Thank you, Melanie! We look forward to hearing more adventures from Katler and the Kittlens.